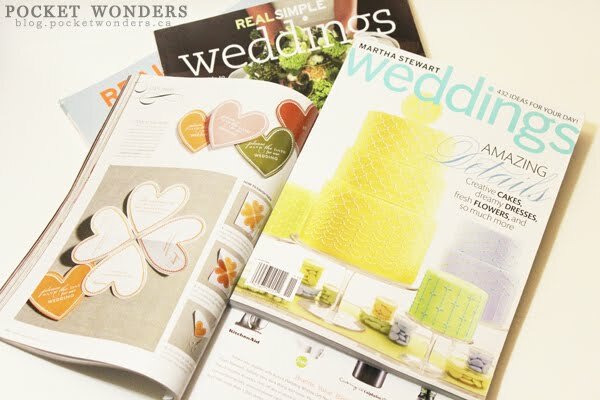 I love love LOVE wedding magazines. This weekend I was at an intensive Wedding Coordinator 2-day class. It was so unbelievably helpful and I highly recommend anyone looking to be a certified wedding planner to take it. The in-class experience with industry experts lecturing really creates a wonderful learning environment. I also made some new friends here and here. My exam is in the upcoming weeks, and if I pass I will be a certified wedding coordinator! Isn't that amazing? I love wedding magazines. especially martha stewart ones! I'm kind of addicted to MS Weddings. Good luck with your exam, that sounds awesome!